Director/Story – Andrew Stanton, Co-Director – Lee Unkrich, Screenplay – Andrew Stanton, Bob Peterson & David Reynolds, Producer – Graham Walters, Photography – Sharon Calahan & Jeremy Lasky, Music – Thomas Newman, Supervising Animator – Dylan Brown, Supervising Technical Director – Oren Jacob, Production Design – Ralph Eggleston. Production Company – Pixar Animation Studio/Disney. The clownfish Marlin is traumatized when a shark devours his wife and their brood of young eggs. Only one egg is left and Marlin names the hatchling Nemo, raising him with utmost care and protection. Marlin tries to delay sending Nemo to school but eventually cannot fight Nemo’s determination to go any longer. On Nemo’s first day at school, Marlin then learns that the class is going on an outing to the edge of the reef and races to stop them. Tired of his father’s over-protection, Nemo ventures out beyond the reef, only to caught in a net by a scuba diver. He is captured and placed in a fishtank in a dentist’s office in Sydney, Australia, where he learns from the other fish in the tank that he is to be given as a gift to the dentist’s niece Darla who has a bad habit of shaking her pet fish to death. The battle-worn Gill, one of the other fish in the tank, tries to come up with a plan to escape before Nemo receives his fate at Darla’s hands. Meanwhile, Marlin, joined by Dory who has short-term memory loss but can read human language, ventures into the perilous depths of the open sea to find Nemo. Finding Nemo was the fifth film from Pixar Animation Studio. After establishing their industry credentials in the late 1980s with a series of highly acclaimed shorts (many of which are now being reissued preceding their feature films), Pixar first appeared with Toy Story (1995). Toy Story created a revolution in animation in that it was the first entirely computer-animated feature film, where computers were not merely used to assist the animators but where the animation was drawn inside the virtual environment. A number of other studios have popped up since jumping on the computer-animation revolution bandwagon but Pixar remains at the forefront, having gone onto make a string of other hits such as A Bug’s Life (1998), Monsters, Inc. (2001), The Incredibles (2004), Cars (2006), Ratatouille (2007), Wall-E (2008), Up (2009), Brave (2012), The Good Dinosaur (2015), Inside Out (2015) and Coco (2017), as well as sequels to many of these. Finding Nemo was directed by Andrew Stanton, who was the co-director on A Bug’s Life, had written most of Pixar’s films up to that point and subsequently went onto make Wall-E and the live-action John Carter (2012). Finding Nemo is an unabashed delight. Most audiences rank it as the one of the best among Pixar’s uniformly excellent output. 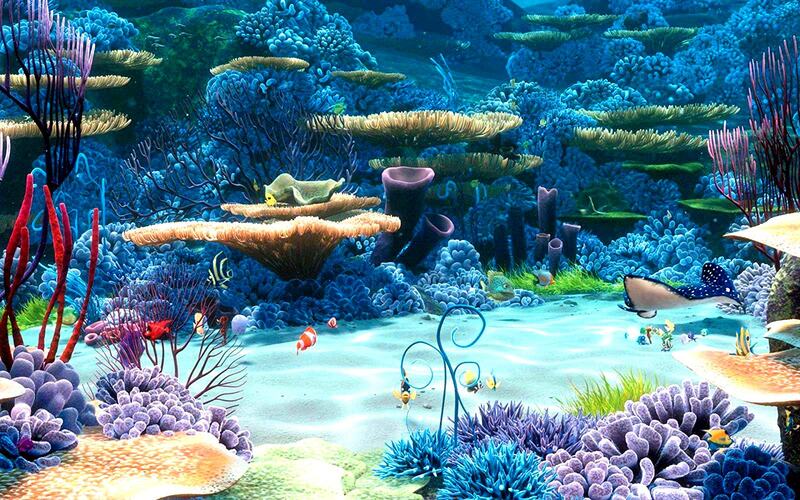 Finding Nemo is an amazingly colourful film. There are few other animated films that one can think of – maybe Rintaro’s Metropolis (2001)? – that use such an amazing vibrant palette of colours in the animation (and frequently all at the same time). Some of the three-dimensional pans around the reef or the fishtank are eye-popping in their vibrancy. Pixar’s skill with stunningly rendered three-dimensional detail has become so effortless that one is being constantly awed at the beauty. The secret blend of Pixar’s films, the thing that makes them so much better than the ones currently being made by their producing partner Disney, is that they manage an effortless mix of humour, likeable and endearing characters, are drawn with breathtakingly beautiful animation, do not come tempered with much in the way of cutsie sentimentalism and, above all, have a level of sly humour for the adults. Disney had previously broached the talking fish concept in sections of The Little Mermaid (1989) – Finding Nemo could almost be a feature-length expansion of the Under de Sea piscine frolics in The Little Mermaid. (Indeed, Robbie Williams gets to do a rendition of the award-winning track over the end credits). Before that there was Disney’s Pinocchio (1940) where there are a number of similarities to that film’s brief underwater sojourn, particularly the vibrancy of the colours. Although, the film that almost certainly must have acted as some inspiration for Pixar was the Danish-made Help! I’m a Fish (2000). Finding Nemo works on the reliable standby of the quest plot but all the appeal of the film is in the wonderfully eccentric characters that come packed away around the edges – from the school of sharks who induct the Marlin into a kind of AA meeting where they are doing their best to forswear eating other fish; a turtle, voiced by director Andrew Stanton himself, who speaks in ebullient surfer speak as though he had strayed in from the Bill & Ted films – a character that Andrew Stanton claims was based on Sean Penn’s character in Fast Times at Ridgemont High (1982); a blowfish who has the bad habit of inflating himself whenever he gets too excited; and a surprise appearance from indie cinema tough guy Willem Dafoe as a leather-beaten fish planning the escape from the aquarium. 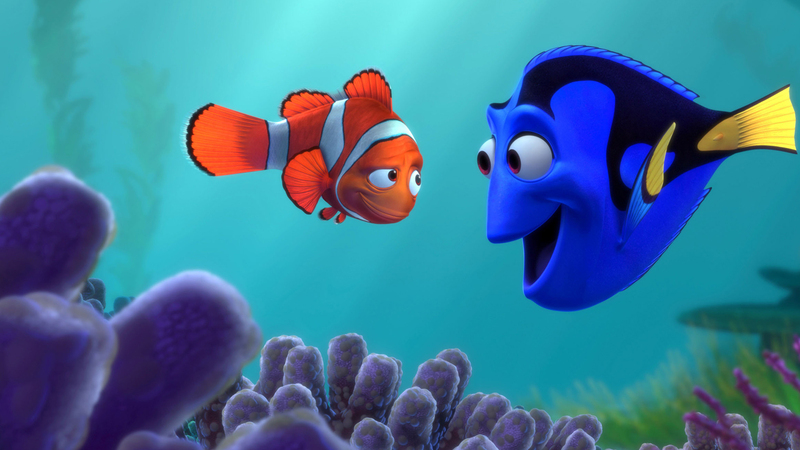 The film is fairly much stolen by Ellen DeGeneres as the fish companion with short-term memory loss. DeGeneres gets into full flight doing the zany ditz role she has perfected. Her voicing is simply delightful in the part and she steals a large part of the film whenever she is around. It is hard to think of any other actress who would be so perfectly suited in the role. The great surprise about Finding Nemo is its surprisingly high Australian content. It is set around a quest to Sydney, whose landmarks prominently feature beyond the dentist’s office. The cast features a substantial line-up of Australian acting talent, including Geoffrey Rush as a pelican, Bill Hunter as the dentist, and Barry Humphries of Dame Edna Everage fame, Eric Bana and Bruce Spence, alias the Gyro Captain from Mad Max 2 (1981), as the pacifist sharks. Why the Australian cultural spin is a mystery – neither co-directors Andrew Stanton or Lee Unkrich claim to have ever been there before the film’s publicity tour and in interviews seemed gratified that they managed to get the details accurate. Finding Dory (2016) was a sequel. Finding Nemo was re-released in 2012 after being converted to 3D. (Winner in this site’s Top 10 Films of 2003 list. No. 2 on the SF, Horror & Fantasy Box-Office Top 10 of 2003 list).